Posted in Charitable Activities, Education and Preservation. Ven. 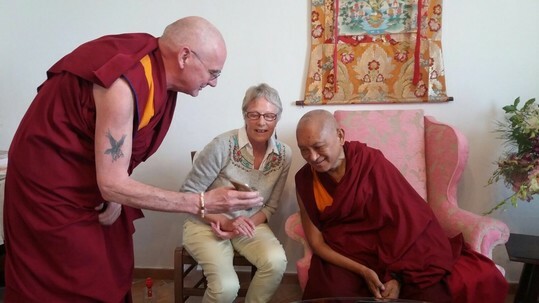 Roger Kunsang showing Lama Zopa Rinpoche the Inner Job Description app on a phone, Pisa, Italy, October 2017. Photo by Violette Pilot. An example of the Inner Job Description app in Chinese on a phone. 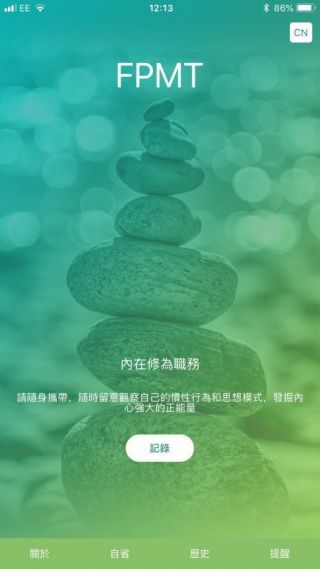 The Inner Job Description App, a free app created by FPMT Inc., is now available in the Amazon, Apple, and Google Play stores in Chinese (更新了截图), English, French (Description du travail intérieur), Italian (Descrizione del Lavoro interiore), Russian (Оценка внутренней работы), and Spanish (Descripción del trabajo Interior). The Inner Job Description app is a tool to help people transform their daily work and activities into their Dharma practice. As Lama Zopa Rinpoche has said, “A person may have all this education from college, university, how to do this, how to do that, how to be a business person and so forth, but if they are missing the inner profession then what is missing is mentally how to live life, how to do everything. “The real profession is missing,” Rinpoche said. An example of the Inner Job Description in Spanish on a phone. “Bodhichitta” reminds app users of six attitudes to cultivate, as discussed by Lama Zopa Rinpoche in the teaching How to Be a Real Professional: Why We Need Dharma. 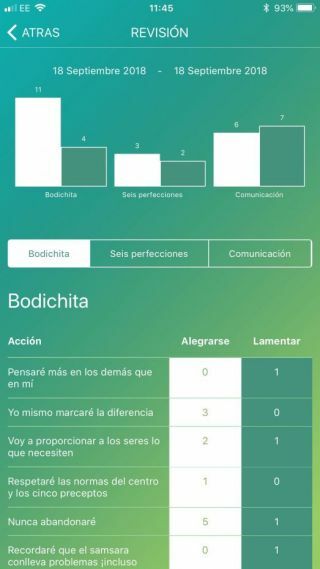 “Perfections” reminds app users of the six perfections practiced by bodhisattvas; generosity, ethical discipline, patience, enthusiastic effort, concentration, and wisdom. The Inner Job Description app can be used to track personal behavior over time, so app users can learn how to make their daily activities a profound inner practice. 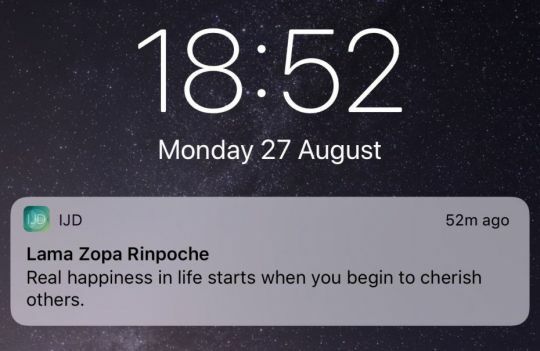 The app also includes an option to receive regular reminders from Lama Zopa Rinpoche and Lama Yeshe in the form of short teachings. An Inner Job Description app reminder in English. As an alternative to the app, the Inner Job Description Card can be printed on A4 or letter size paper. Thank you to the all of the translators and supporters who enabled the creation of the Inner Job Description app. The app was made possible by a grant from the Education and Preservation Fund, which supports Dharma study and contributes to the development of Buddhist education programs and the preservation of the Dharma through the publication of Dharma practice materials and translations. Additionally, this project was awarded a Merit Box grant. Monks participating in the annual Winter Jang Debate. This January, monks from various Gelug monasteries participated in an extensive twenty-two day debate on Buddhist logic in Bodhgaya, India, known as the Winter Jang Debate. This annual debate dates back to the time of Lama Tsongkhapa and was continued each year until 1959. In 1981 the present and former abbots of the three great monasteries met to revive this debate. However, due to costs the monasteries were only able to sponsor about 200 monks to attend. Seeing the incredible importance of this tradition of bringing together the best scholars to hone their understanding of the Buddha’s highest teachings, Lama Zopa Rinpoche, through the Lama Tsongkhapa Teachers Fund, now sponsors 400 monks from Sera Je Monastery to attend. This expenditure includes: bus rentals to transport the monks to and from Bangalore; train accommodation to and from Bangalore to Bodhgaya; floor mats for the monks; food offering; as well as the expenses associated with three professors, two teachers, and four monitors to attending. 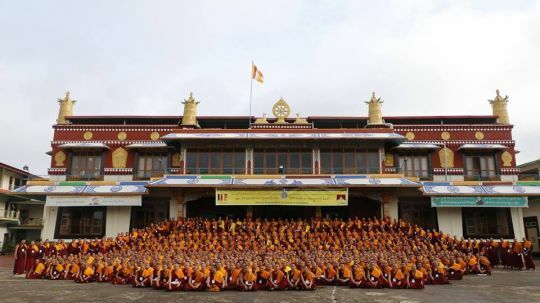 Additionally this year, annual sponsorship was offered to Sera Je Monastery for 190 monks who qualified and passed the yearly Special Memorization Examination. A new set of robes was offered to these future teachers who contribute to the preservation the Lama Tsongkhapa tradition of Tibetan Buddhism in the monasteries. The memorization of these monumental works is truly something to rejoice in. The grants toward the Winter Jang Debate and the Special Memorization Examination totaled US$26,959 this year. Tremendous thanks to the many donors who support the Lama Tsongkhapa Teachers Fund enabling FPMT to sponsor the monks engaging in debate and memorization at this high level for the benefit of all. You are welcome to participate in this offering at any time. You can learn more about the beneficial activities of the Lama Tsongkhapa Teachers Fund or the many Charitable Projects of FPMT. In 1976, Geshe Lhundub Sopa, one of Lama Zopa Rinpoche’s teachers, began offering commentary to Lama Tsongkhapa’s Lamrim Chenmo. 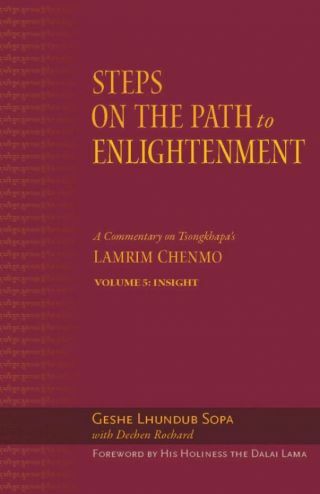 The lamrim, or “graduated path,” is a presentation of Shakyamuni Buddha’s teachings that detail the stages on the complete path to enlightenment. 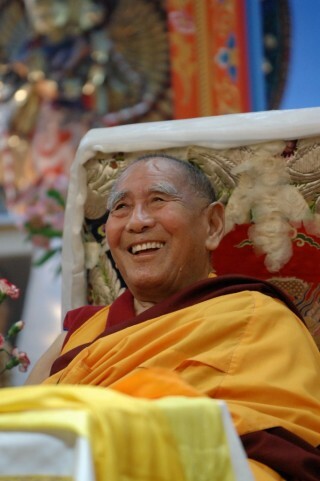 Geshe Sopa’s teachings continued into the early 1990s. In 1994, discussions on turning the audio teachings into a book series commenced. 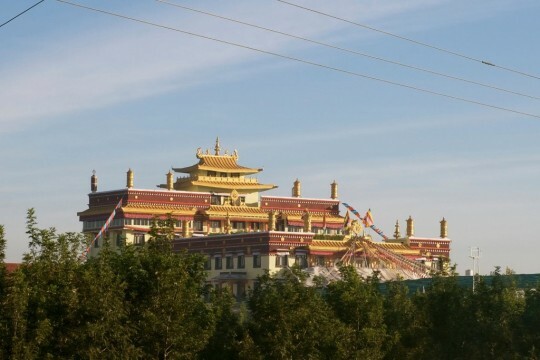 And in 1995, Lama Zopa Rinpoche took on the responsibility of sourcing the project’s funding. Shortly after, a very kind benefactor came forward to sponsor it. In all, US$500,000 was raised for this incredible project. Over the next twenty-three years, Wisdom Publications published a five-volume series called Steps on the Path to Enlightenment. Producing these volumes involved laborious effort on the part of translators, transcribers, and editors—not to mention that each editor read their drafts to Geshe Sopa many times, incorporating his feedback and refinements. The result is the longest and most detailed lamrim commentary available in English. 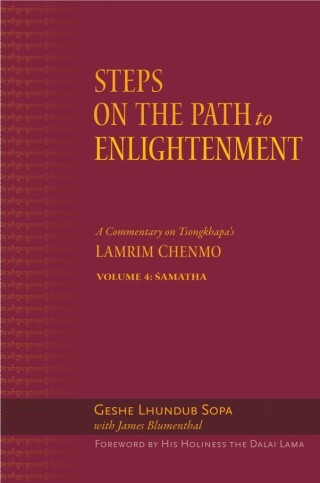 Steps on the Path to Enlightenment, Vol. 1: The Foundational Practices; Vol. 2: Karma; Vol. 3: The Way of the Bodhisattva; Vol. 4: Śamatha; and now Vol. 5: Insight are currently available through Wisdom’s website. The final and longest volume in the series focuses on the nature of reality. In addition to the teachings themselves, the book features an extensive glossary of technical terms. All are welcome to order Steps on the Path to Enlightenment, Vol. 5: Insight directly from Wisdom Publications now. Please rejoice in the completion of this incredible project decades in the making! Posted in Education and Preservation, Ordained Sangha. 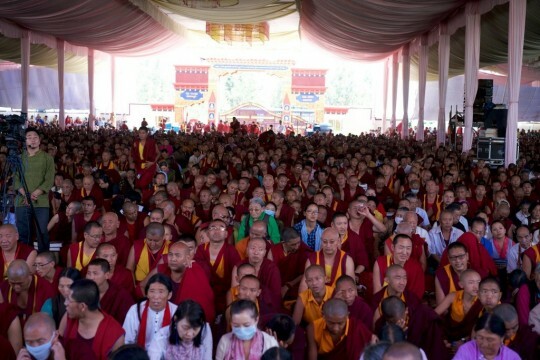 751 top scholars participated in this year’s Gelug exam at Drepung Monastery. Participants enjoying a meal sponsored by the Lama Tsongkhapa Teachers Fund. Each year the foremost scholars from the main Gelug monasteries come together for the annual Gelug examination and the Lama Tsongkhapa Teachers Fund offers a grant to cover the basic expenses including food for participants. 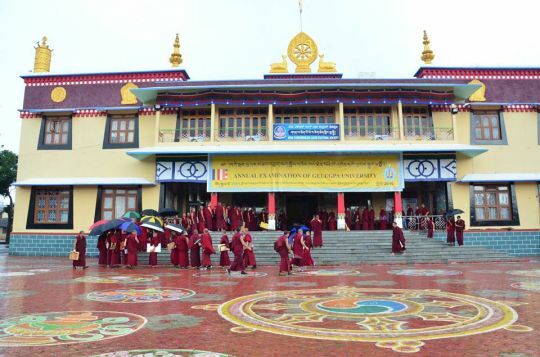 In September of this year 751 monks participated in this annual Gelug exam at Drepung Monastery, South India. Monks participating in the yearly Gelug examination. Yearly stipends were also offered to the 128 current abbots, past abbots and main teachers of the Lama Tsongkhapa tradition. This small offering of money supports these incredibly precious teachers’ basic needs. This allows them to be able to focus more of their time on transmitting Dharma to their students at the monasteries and strengthening their own practices. US$20,778 was offered this year for expenses associated with the exam and for the teacher stipends. The Lama Tsongkhapa Teachers Fund would like to congratulate all the monks for their commitment and dedication to their studies. Due to this grant each year, all qualified monks are able to participate in the debate and examination, rather than being exempt due to prohibitive costs. Since its inception, the Lama Tsongkhapa Teachers Fund, an extension of the Supporting Ordained Sangha Fund, has supported up to 150 senior teachers each year of the main monasteries, plus hundreds of monks attending the traditional winter debate and annual Gelug exam. 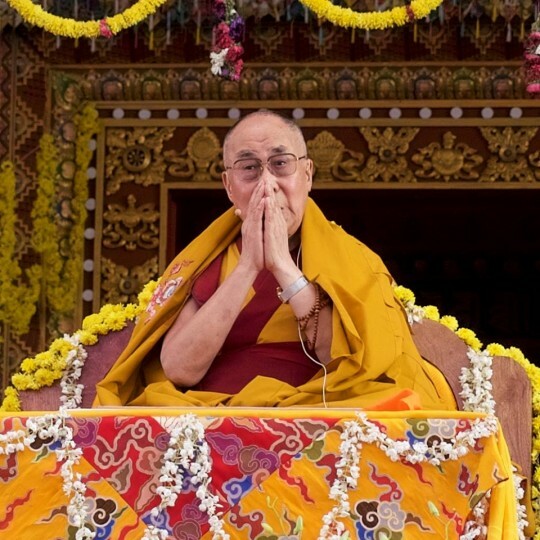 His Holiness at Tashi Lhunpo, Karnataka, India, January 1, 2016. Photo by Bill Kane. In December, the Preserving the Lineage Fund sponsored the offering of lunch to 17,000 people during His Holiness the Dalai Lama’s anticipated three day teaching event at Tashi Lhunpo Monastery which preceded His Holiness’s Jangchup Lamrim teachings, also held at Tashi Lhunpo. Due to a schedule change, His Holiness taught for one day rather than three for this teaching event. Fortunately, His Holiness has accepted an invitation to continue teaching at Tashi Lhunpo in the very near future. The funds already offered for the two days of food that were not used will be applied towards offering food to all who attend during His Holiness’s next visit. Tashi Lunpo Monastery, Karnataka, India. Photo by Bill Kane. This was such an incredible opportunity to make offerings to so many people attending His Holiness the Dalai Lama’s teachings, the majority who were ordained Sangha. 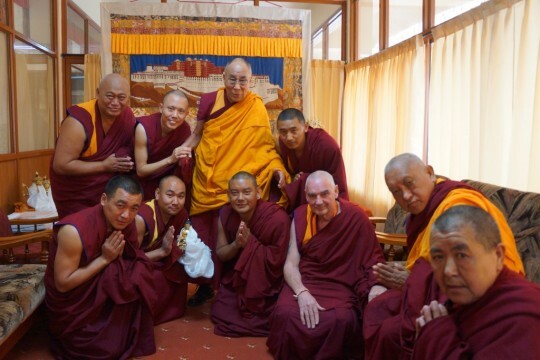 You can learn more about the Preserving the Lineage Fund as well as the Supporting Ordained Sangha Fund to learn more about how FPMT Charitable Projects support monks and nuns around the world. His Holiness during long life puja offered at Tashi Lhunpo Monastery, January 2016. Photo by Bill Kane. 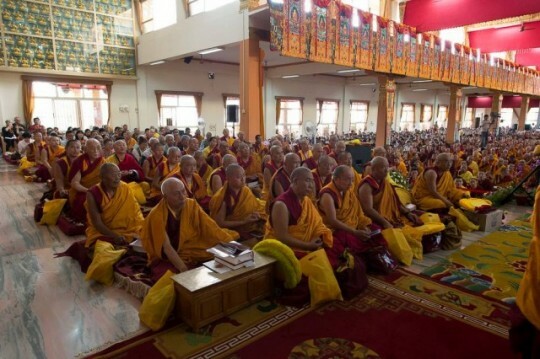 During the 2015 Jangchup Lamrim teachings (18 Treatises on the Stages of the Path to Enlightenment) with His Holiness the Dalai Lama at the newly inaugurated Tashi Lhunpo Monastery, Lama Zopa Rinpoche offered tea to 32,000 participants, money offerings to the 18,100 Sangha present, and Rinpoche also composed a dedication which was made during these offerings. The cost of this was US$21,273 and made possible through the Preserving the Lineage Fund. Rinpoche commented that all of the thousands of people present were students of the same guru, including the 18,100 ordained Sangha, so the merit of making these offerings was incredible. 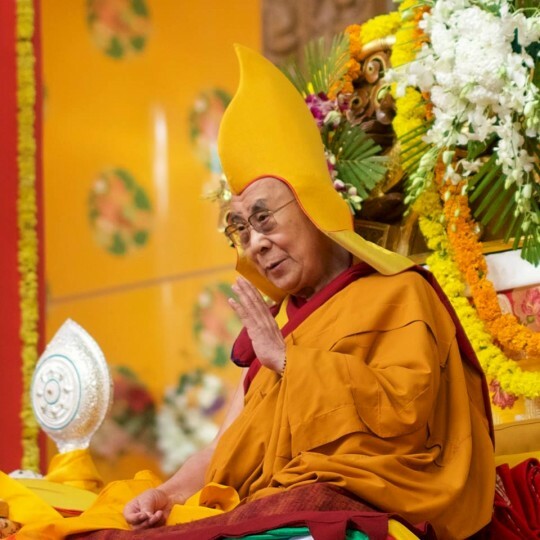 32,000 participants attended His Holiness the Dalai Lama’s Jangchup Lamrim teachings this year. Tea was offered to all and a money offering to all 18,100 Sangha in attendance. This is a small section of the entire crowd. This teaching series began in 2012 and concluded with the 2015 event. The teachings themselves are incredibly precious and rare. 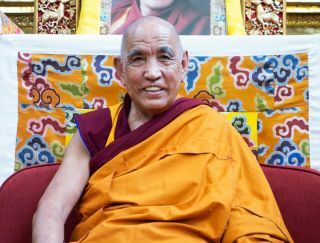 His Holiness received the transmission by the former incarnation of His Eminence Ling Rinpoche and in this life, Ling Rinpoche, who was the main organizer of this four-year teaching event, requested His Holiness to offer these commentaries and transmission. This is the only time His Holiness has ever given teachings on 18 Treatises on the Stages of the Path to Enlightenment. At the conclusion there was a long life puja for His Holiness at Tashi Lhunpo Monastery and Lama Zopa Rinpoche offered a silver Dharamchakra on behalf of FPMT and all beings to his Holiness directly (pictured in top photo). 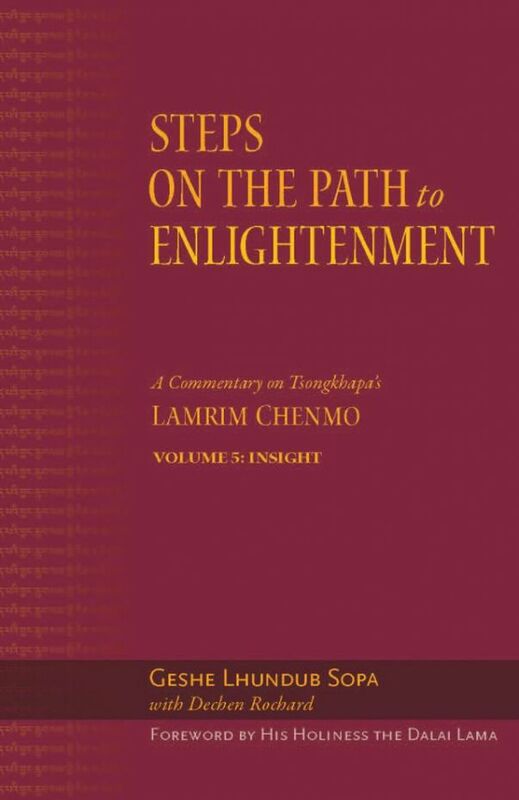 For over eighteen years Wisdom Publications has been working on publishing a series of commentaries, Steps on the Path to Enlightenment, on Lama Tsongkhapa’s Lam-rim Chenmo by Geshe Lhundub Sopa. Volumes, 1 (The Foundational Practices), 2 (Karma), 3 (The Way of the Bodhisattva) and 4 (Śamatha) are currently available through Wisdom’s website and a final volume (5) on emptiness (the perfection of wisdom) will be released in 2017. Due to a gift from a very kind and generous benefactor, the FPMT Education and Preservation Fund was able to set up a special fund to sponsor this project. To date, over US$300,000 has been offered to this invaluable series. 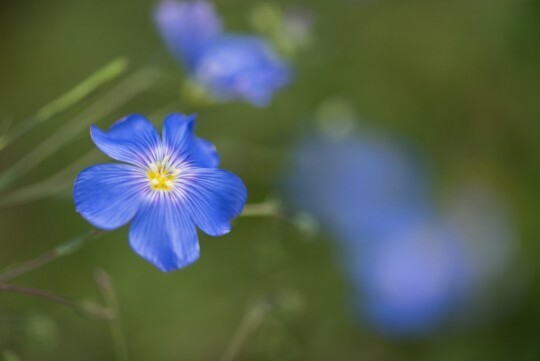 While mindfulness is keeping your focus on your chosen object of meditation, the function of introspection is to constantly check whether excitement or laxity have arisen or are about to arise. This mental spy subtly examines your mental state again and again. “To preserve introspection” means to continually re-engage in examination; this is how you maintain introspection and reinvigorate your mindfulness. These are two different but complementary skills. When you are trying to meditate, you maintain your focus on your chosen object with mindfulness while repeatedly checking for the two obstacles with the vigilant mental spy of introspection. These two techniques work together to keep your mind from coming under the control of excitement and laxity. You must gain facility in both of these skills if you want to be successful in your meditation practice. 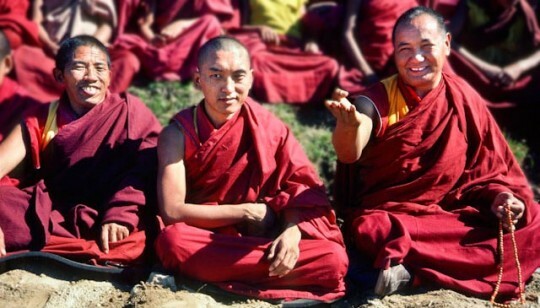 Geshe Jampa Gyatso, Lama Zopa Rinpoche and Lama Yeshe, Kopan Monastery, Nepal, 1979. Photo courtesy of the Lama Yeshe Wisdom Archive. The Masters Program (MP) is the FPMT’s most advanced study program. 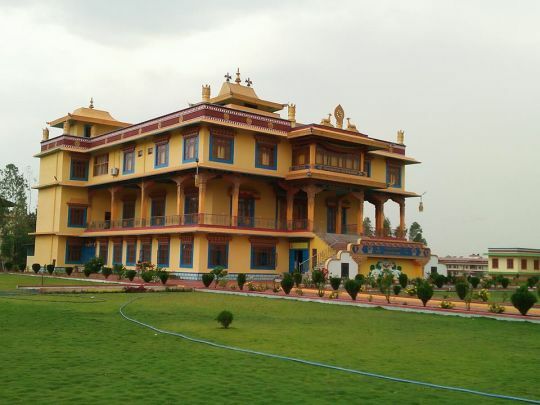 Based on Lama Yeshe’s unique vision for a comprehensive education, inspired by the traditional geshe studies at the great Gelugpa monastic universities, it was developed with the help of Geshe Jampa Gyatso. Integrating behavior, training and service components, the program offers in-depth study of five great texts and extensive retreat experience, providing a thorough grounding in sutra and tantra. Due to the kindness of a generous benefactor, the Education and Preservation Fund recently offered US$54,625 to Istituto Lama Tzong Khapa for their latest Masters Program in Buddhist Studies of Sutra and Tantra which commenced in March. The full-time residential program consists of just over six years of study (nine months per year) and a total of one year of retreat after the conclusion of the studies. The study portion of the program will conclude in mid-2021. In addition to teachings with the geshes, students will be supported by review classes with tutors, in which they will deepen their understanding through debate and discussion of the material. Students’ progress is measured by a combination of written and oral exams, research projects, and presentations, and they will also receive instruction in meditation and develop the skills to guide meditations and lead retreats. Students will also have opportunities to study the classical Tibetan language as well as to participate in seminars by visiting Western Buddhist scholars and academics. Talks by practitioners with extensive retreat experience will also be arranged in order to provide guidance and support for contemplative practice. To provide opportunities for integrating the teachings into practice and for students to acquire retreat experience in preparation for the final one-year retreat, students will have regular opportunities to engage in lam rim retreats during the program at the end of each of the principal subjects. They will also be required to participate in regular meditation sessions during the week, and will receive instruction in leading meditations for others. This grant from the Education and Preservation Fund will enable the current program to be offered successfully. You are welcome to offer any amount to this fund so that grants such as this can continue in the future. The Masters Program Online (MPOL) offers the opportunity to study the MP to those who are unable to join the residential program, making use of the latest online educational tools available, in an online learning environment. 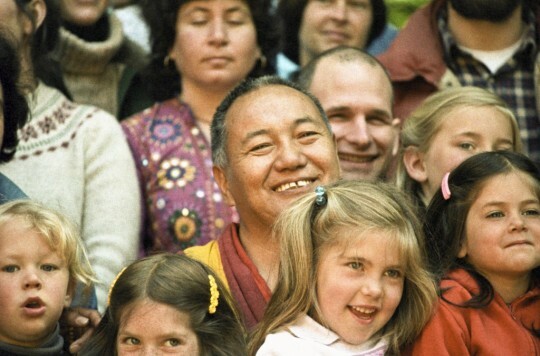 Lama Yeshe with children and students in California, 1983. Lama Yeshe’s proposal for education was to draw on the “heritage of wisdom” that resides in the great religious and philosophical traditions of the world to create a new kind of Universal Education. Photo courtesy of the Lama Yeshe Wisdom Archive. FPMT’s founder, Lama Yeshe, established what he called “Universal Education” which was an education of human hearts focusing on the universal language of compassion and wisdom, rather than emphasizing a strictly Buddhist approach. Lama Yeshe’s view was that the aims and methods of many modern education systems over-emphasize intellectual achievements and are too limited in their scope. As a result, they fail to enable children, young people and adults to fully develop their potential, to lead a fulfilled and meaningful life, and to play their part in creating a more peaceful world. Lama Yeshe’s proposal was to draw on the “heritage of wisdom” that resides in the great religious and philosophical traditions of the world to create a new kind of Universal Education. You can watch a video of Lama Yeshe discussing the purpose of Universal Education in 1982. The Education and Preservation Fund was pleased to recently offer US$50,000 toward the incredible ongoing work and annual budget of FDCW. You can learn more about the work of FDWC, get involved, or explore the resources available to you. The Education and Preservation Fund supports Dharma study and contributes to the development of homestudy programs, online Buddhist education programs and the preservation of the Dharma through the publication of Dharma practice materials and translations.